HEM Precious Chandan 20 x 9 inch hand rolled incense stick hex pack. 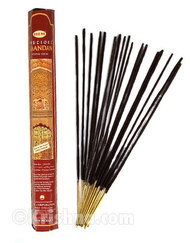 The purifying fragrance of HEM Precious Chandan incense stems from its rich roots of Sandalwood. This ancient scent has passed a number of generations and has maintained its traditional classic aroma.